The recording of debt has a long history. (a) Tally sticks were commonly used in medieval Europe. A marked wooden stick representing the transactional value was split into halves of different lengths. The creditor kept the longer part (stock) and the debtor was given the shorter one (foil). The stock represented a claim to future income and was actively traded (stock market). 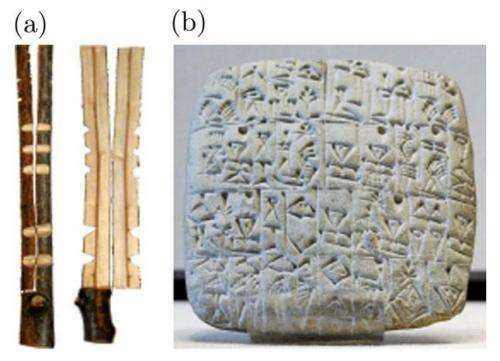 (b) Clay tablets served a similar function and recorded credit money contracts. (Phys.org) —Borrowing and lending money are essential interactions in a thriving economy, yet they come with their own set of risks. For instance, the credit money that is often involved in lending is thought to play a major role in causing large-scale financial crises, such as real estate collapses. As part of this balancing act, economists face the challenge of simultaneously maintaining both liquidity and stability (in the form of a constant money supply) to keep the economy moving along at a steady, controlled pace. In an attempt to reach these goals, a team of researchers has turned to the field of "econophysics," in which theories originally developed for physics are applied to economics. Physicists Matthias Schmitt, Andreas Schacker, and Dieter Braun at LMU Munich have published a paper on their ideas, influenced by statistical mechanics, in a recent issue of the New Journal of Physics. In their paper, the scientists propose that the traditional notion of credit be replaced by a new concept that involves two types of currencies: money and "antimoney." While money is cold, hard cash, antimoney is basically the same as debt. However, unlike money and debt (or matter and antimatter), money and antimoney do not cancel out (or annihilate). This is because antimoney is not simply negative money; money and antimoney units are never added or subtracted to each other. Instead, money and antimoney are entirely different currencies, as different as euros, pounds, yen, dollars, etc. As different currencies, money and antimoney have a constantly changing exchange rate. The purpose of the exchange rate is to prevent the inflation—or devaluation of the money currency—that comes with loaning and borrowing money. It's well-known in economics that traditional credit causes inflation by increasing the money supply, at least on paper. The problem with credit-induced inflation, the researchers explain, is that it negatively influences all market participants, while credit holders profit from the inflation because they wind up paying back their loans in devalued currency. This problematic effect of credit can in principle be alleviated by full-reserve banking, in which banks are required to keep the full amount of their depositors' funds in cash, i.e., the banks are prohibited from credit creation and the money supply remains constant. Unfortunately, full-reserve banking traditionally results in low liquidity or "credit crunches" and therefore slow economic growth. In the money-antimoney economy, however, the researchers show that it's possible to implement full-reserve banking while providing sufficient liquidity. In this type of economy, market participants reap one of the most important benefits from full-reserve banking, which is a constant money supply. This benefit is due to the nature of a bicurrency system, the researchers explain. "We find that, hiding in banking, you have an exchange rate between money and antimoney, i.e. that the creation of banking actually splits a given currency into two—but without allowing markets to judge the performance of the banks and judging the banks with this hidden but nowadays fixed exchange rate," Braun told Phys.org. "It was right in front of our eyes, but apparently was not seen. "We also find that the these two currencies make it possible to do credit transactions without interest rates and without changing the quantity of money—and all this under a most dogmatic, neo-liberal, free market hypothesis. It is like finding an inherent contradiction right inside banking. And something we could not use before computers." To analyze this new economic structure, the scientists used a physics method called random transfers. In the model, agents randomly exchange money and antimoney, much like particles exchange energy. The randomness reflects the fact that an economic environment and the future of investments are difficult to predict for the agents. The results of the model showed that the money-antimoney economy offers advantages such as high liquidity, broad wealth distribution, and stability. As the researchers explain, the key difference between a traditional credit economy and the money-antimoney economy is the nature of the borrowing/lending process. In a credit economy, a borrower receives a loan in the form of money along with a promissory note showing that the borrower agrees to pay back the money at a specified time. In the money-antimoney economy, a borrower receives both money and antimoney with electronic date stamps, but no promissory note, from a lender. This system requires that the lender have sufficient antimoney, i.e., debt, as well as money, to give the borrower. The interesting thing about this transaction is that the borrower never pays the lender back. There is no need to pay anything back, since the borrower received both money and antimoney (debt) from the lender. Instead, the borrower will give the antimoney along with money to someone else by a certain future date. The specific ratio of money and antimoney in the original loan transaction depends on the exchange rate between the two currencies, which is determined in part by the borrower's standing and also takes the place of the interest rate that the borrower and lender traditionally agree upon. So instead of relying on interest rates to judge the future value of a loan, the money-antimoney exchange rate dynamically compares the values of the past (antimoney) with the values of the future (money). No other market participants are affected by this transaction other than the borrower and lender who are directly involved. "A loan transaction is a differential bet on the future between two participants," Braun explained. "One will want to buy a house, resulting in him after buying it with more antimoney than money. This means he will lose if antimoney becomes more valuable, but win if money becomes more valuable. The other wants to sell a house and wants the money, making him to have more money and less antimoney. So he will lose in the exact opposite scenario. So we hope (but cannot yet 'prove'—but what can you prove in economics?) that this leads to a well-balanced equilibrium between both strategies. One part betting on future investments, the other betting on selling past investment. It is fully symmetric, and all trading is real-time as opposed to interest rates which cannot go below 0% and require long-term, not-real-time contracts which feed delays into the economy. For us, this sounds interesting enough to follow it up with studying it to check its stability in more real-world situations, starting with a game theory competition between algorithms." As for implementing the bicurrency system, the researchers note that money and antimony are already used in banks, just not separated. Still, implementation will involve some challenges. Just as some individuals in a credit economy accumulate more debt than they should, in the money-antimoney economy there is still the problem of individuals who hoard large amounts of antimoney. To prevent this, the researchers propose, for example, that caps can be imposed on an individual's antimoney, just as credit caps are imposed on individuals today. If an individual goes bankrupt after borrowing a loan of money and antimoney, the lender would have to take the antimoney back and become responsible for passing it on to someone else. This is the equivalent of a write-off today. "One needs to keep track that no-one can destroy antimoney," Braun said. "There is a long-lasting history on this, starting with the clay tablets or the stock/stub pairs. Nowadays, cryptographic techniques will allow for this (similar to bitcoins—which, by the way, are completely missing that money is about debt contracts, not gold=computer-power backing). Such a cryptographic system needs to keep traders anonymous, but still keep track about the trades, such that if people choose to leave the system or die, the money and antimoney units are given back by the previous traders such that they are forced to add premiums into the exchange rates to ensure themselves against such odds. I think (and hope) that this cryptographic problem will be solvable. Anyhow, we will first need to see that the system behaves in a stable way under real-world investment markets." In this case you have two currencies too. Antimoney and money BOTH have positive value. It's exactly what they want to avoid in the current system. Physicists should stay out of economics. How do they propose to adjust and regulate the amount of money and antimoney in the total economy if neither can be destroyed or made anew? Where does this money and antimoney come from in the first place? The problem with credit-induced inflation, the researchers explain, is that it negatively influences all market participants, while credit holders profit from the inflation because they wind up paying back their loans in devalued currency. That is how the system is supposed to work. As money created by debt is destroyed on payback of said debt, the inflation simply means people are able to pay off their debts quicker and with less effort and the prices normalize as the extra money dissapears. The banks who issue the loans lose because the existing credit loses value. The only real problem is corporate socialism that allows banks to create too much money to profit on the short term, and then get bailed out by the society through its corrupt leaders. Financial crises are inevitable. The economic cycle - growth, decay, collapse, and rebirth - is the unavoidable consequence of investment. Pharaoh frees money to build a new project. Workers prosper and their families swell. Growth always occurs faster than the infrastructure can be created to sustain it. Inflation sets in, competition escalates, and corruption soon follow. Collapse is always the result. But as cycles are inevitable, they can also be anticipated. They can be planned for. And they can thus be used to generate enormous wealth. Pharaoh asked Joseph to interpret his dreams. " God is telling you that 7 years of feast will be followed by 7 of famine." "Whatever should we do?" asks pharaoh. "Prepare." was the reply. But really, did they need a god to tell them this? They stored grain for 7 years and when the collapse came they sold it back to the people. And they ended up owning everything of value in Egypt. This is how your world is Run. This is clearly an April Fool's joke. The best time to see this happening is right after the last collapse. Laws are easily passed which enable the next round of investment, with the excuse of rebuilding the economy. These laws enable exactly the kinds of abuses which lead to the next wild run up and subsequent collapse. Greed is also inevitable. As such it can be a powerful and dependable Tool when channeled in the proper Direction. Greed can be used to tailor and time economic bubbles so that collapse happens at the proper Time and in the proper Manner. Collapse can thus be a Creative and Constructive Force whereas, if left to happen by itself, it could destroy the entire economic structure. Planning - it is what defines our species. We should expect to find it at work at the very highest levels of civilization. We should also expect that the very highest Levels would be operating safely beyond the influence of public scrutiny. Plans must often entail Decisions of which the majority of the people would not approve. "economists face the challenge of simultaneously maintaining both liquidity and stability (in the form of a constant money supply) to keep the economy moving along at a steady, controlled pace." Why is this a job for anyone? How can any economy be controlled? Monopoly or Duopoly? I prefer the later. So does the history of successful, peaceful civilizations. Money should function like a utility and be illegal to hoard. Prof. Viktor Yakovenko (UMD Dept. of Physics) has been developing the field of Econophysics since 1997: "Statistical mechanics of money" by A. A. Dragulescu and V. M. Yakovenko - Published: The European Physical Journal B, v. 17, pp. 723-729 (2000). He drew the mathematical analogy between money/energy and between individuals/molecules that led to the application of Statistical Mechanics to economic dynamics. He demonstrated that different statistical mechanical distribution laws apply to different types of economic systems, particularly with regard to the equilibrium distribution of money among the population. The models can accommodate 'debt' as an analog of 'negative energy', as they are signed scalars. The mathematics of 'antimoney' as described (money and antimoney units are never added or subtracted to each other) is as incompatible with 'money' as an orthogonal dimension. It's like representing 'cash' with complex numbers. But as cycles are inevitable, they can also be anticipated. They can be planned for. and a VERY few like him to tell us THAT it is going to happen, but even he could not say WHEN. Kramer and Kudlow denied it would ever happen EVEN as it was happening - but YOU trust them!keep trusting! OR, more precisely, the players in the market, the actual Market Makers, ADAPT to the new rules which killed the old abuses and closed the loopholes....PURCHASE some political access to add a few rules or changes to oversight that allow them to migrate to new ways of graft and excess. But the need to rescue an economy from the ditch can require new regulation and practices for a limited time that prevents them from becoming longstanding policy and pathways to corruption or financial misconduct. Each nation has to deal with economic pain or fail. BUT all economies grow more connected everyday and in every way because people have such common needs and goals. Human need IS a world order unto itself. FTA: "One will want to buy a house, resulting in him after buying it with more antimoney than money. This means he will lose if antimoney becomes more valuable, but win if money becomes more valuable." It is the same all over, wherever there are PEOPLE but up in Canada where Rob Ford is king and everyone is so peaceful and nice and lovey-dovey, and all that, you would expect everything to be hunky-dorie economically right? I mean Canadians just want to get along and live and let live right? Wrong! Greed is NOT good and impossible to regulate as you suggest so very erroneously. The elitists ALWAYS think they alone know whats best - If the ones at the top knew what was best the Roman Empire would've started the European Union 2000 years ago & survived - Mitt Romnoids believed in collapse & it killed his political ambition - you cant SAY' let GM go broke' except you are an elitist-forget being president! Saw on CNN a factory needed to make cuts - they took it to the workers - the leadership had doubts. The workers easily saw the big picture & MADE CUTS! A strong, wise electorate is BEST! Too complicated. There is an easier way. We need elections in the economy just like elections in politics. Those that fail get to pay the price at set points in time. In elections, those that fail are tossed out. In the economy, it would work like this: Automatic debt release every 7 years. Businesses will eat bad decisions every 7 years. If it is rational and too equitable, the Fed as stooges of the fat cat financial establishment would veto it since it would eliminate their greed driven monopoly. Has a snowball's chance in hell just like the ideal solution to legislative corruption, term limits. There is no "physics" of money. Money is a mere political fiction of convenience, not a physical system. What is physical in an economy is the production of that which sustains a population at a desired increase of standard if living. This is energy, manufactures, infrastructure, food, etc. THAT is physical. The monetary system must be developed to increase the rate of growth per capita of these systems. Critical in this, is to promote investment in energy-throughput-density to perform ever greater amount of work quantitatively and qualitatively. This represents a reducing power for a national economy. The aim of government must be to optimize this process by making credit available for this overarching purpose. This is what Alexander Hamilton did by establishing a National Bank. When speculators create categories of debt like derivatives this erodes the ability of the nation to promote these necessary investments. This "funny money's" claim on the economy is like a cancerous growth. Automatic debt release every 7 years. Businesses will eat bad decisions every 7 years. I have no problem with this! to protect property rights, period. When govts control the money, the govt will fail to protect everyone's property rights and becomes the master to the serfs. If the govt didn't control the money, then the speculators can create whatever they want, if they can sell it. If it's fraud, the function of the govt is prosecute theft and fraud. "It's well-known in economics that traditional credit causes inflation by increasing the money supply..."
No it's not. See Japan. The notion that two different non-interchangeable and non-inter-tradeable currencies could exist is impossible. It shows that the authors of this paper allow themselves to propose arbitrary rules that are inviolate, as if humans would obey such. The idea that there is any such thing as "hard cash" today is just wrong. Virtually all money today is credit money - which becomes a deposit and "real money". All we have now is "anti-money" in their parlance. These authors don't understand how banking works today, nor the role of central banks. Sorry, ryggesogn2, but you are absolutely wrong. ALL money is debt in today's world. The money that pays your salary, is somebody else's debt. This paper doesn't appear to be an April Fool's day joke, but it should be. This is absolutely true in the United States because of the Federal Reserve system. If we had no debt you'd literally have no money in circulation. This does NOT mean you wouldn't have currency however. "if the money supply increases then it will be devalued and therefore buy fewer goods or services. This is the definition of inflation. It works the same everywhere...."
Absolutely not. The definition of inflation is that against a broad range of commodities, goods and services, there is a rise in price. The definition of deflation is that against a broad range of commodities, goods and services, there is a decline in price. You see, in the modern world there is a continuous invention of new goods and services, and a continuous increase in the number of people. That means that to keep pace the money supply MUST continue to increase at the same rate just to stay even. And that's just the beginning, because not all money is circulating money. It is always astonishing to me that the exact same engineers who are responsible for CREATING most of the new value (compare 30 years ago - cell phones, computers, internet, and that's just scratching the surface), don't understand this. Sorry but there is no god of abraham because he described things in his book we know didnt happen. Archeology tells us this. Archeology also tells us that ancient rulers kept meticulous records of food distribution and censuses. This would have told them how fast their pops were growing in relation to their ability to feed them. "There was a time when the countless tribes of men, though wide-dispersed, oppressed the surface of the deep-bosomed Earth, and Zeus saw it and had pity, and in his wise heart resolved to relieve the all-nurturing Earth of men, by causing the great struggle of the Ilian war, that the load of death might empty the world. And so the heroes were slain in Troy, and the plan of Zeus came to pass." -Similar refs to overpopulation can be found throughout history. Malthus was only tasked to reveal to the general public what Leaders had known for millenia. And you STILL dont get it. What is even more physical is the mathematical reality that pops have always grown faster than the ability to feed them. Any species will produce more offspring than can be expected to survive to maturity. HUMANS ARE NO DIFFERENT. And as soon as we became able to hunt those predators that were keeping our numbers in check, humanity became a plague upon the earth. Our tropical repro rate never had the chance to compensate. And this is what drives economic cycles. Prosperity has always caused pops to grow beyond their ability to sustain themselves. And when people begin to suffer, and children begin to starve, the people will blame whoever is in charge for their troubles. So much of the human condition is pathology. We are the first species who can dwell on the fact that we will eventually grow old and die. This drives many of us mad, and is probably why we put so much effort into sustaining the fantasy of life after death. Greed is an extension of this. Unlike the other animals we can conjure pictures of us and our families starving at some future time, and naturally we will tend to hoard as a hedge. This doesnt make greed any less inevitable or dependable as a Tool for preserving overall Stability and Progress. The people can always be expected to favor the interests of their families and tribes. This too is dependable. There are decisions which can never be left up to either the people or the 'elite' you are referring to. There must exist Order above what we can see. There must be Leaders in Charge who are making the decisions that we could never make for ourselves. I think many commentators would find after reading it that their concerns are addressed. Let's not be narrow minded and reject something before fully understanding it. From what I see, the two currencies would revolutionize capitalism. Whether the powers that would lose from the conversion to this system would allow it to happen is another question. It might need to wait for the total collapse of the world economy, something that, of course, recently almost came to pass. The definition of inflation is that against a broad range of commodities, goods and services, there is a rise in price. The rise in price is because the value of the money has decreased due to govts inflating the supply of money. Rome inflated their gold coins by shaving off gold from coins and minting new coins from the gold. The value of the coin was not based on the mass of gold in the coin, but what the govt said its value is. Fiat currency is much easier to inflate. Now instead of actually printing bills, the govt only needs to play with the computers. In physics negative energy refers to gravity. What that implies in economy? When you begin accumulating antimoney what prevents you from destroying it so your money/antimoney ratio improves? It must be that all transactions involving antimoney are recorded and that's why it's implied in the article that this whole scheme is possible now only because of computers. That further implies anybody can become a lender, e.g. you want to sell your car and some guy wants to buy it but he doesn't have enough money so you sign it over to him and he has to take a bunch of your antimoney which you transfer via your iPhone. That further implies everyone's official money/antimoney ratio has to be known along with the current exchange rate or no one will risk the transfer formerly called lending. That in turn implies banks will become more clearing houses for that information and less needed as lending institutions. It also implies the Fed will become just the clearing house for government activities and not tasked with fighting inflation. It sounds like it might work. For those who don't understand physics, a monetary economy is psychology in action; for those who understand physics, a monetary economy is pseudoscience at its best/worst. Opinions on monetary economies are indicative of the size of the box that was used for thinking. We can make a machine to do the work of many people—how offensive is it to put a slot for quarters in the machine for people to pay when they no longer have the work by which to earn the quarters? And how inhumane is it to price education and retraining out of reach while simultaneously advocating reduction of assistance programs? The 19th-century industrial work ethic has run its course, severely degrading and altering the biosphere along the way. The 'frontier mentality' is good only for when the world is flat and infinite. Now that we know it's round and finite, we have more important work to do than being cogs in an anachronistic economy that's holding us all back in most respects. With the proper application of physics, engineering and money, the world is not finite. Too bad so many who are involved with science don't have any imagination. With the proper perspective, our planet's comparable to a wet speck of dust in a good location and no amount of money will change that. Spacetime may be flat and infinite but our planet certainly isn't. That statement reflects on no one but the person who uttered it. But any reasonable limit is a long way off. With innovation, physics, wealth, people, the limit for humans is infinite. Ehrlich's disciples are more interested in control and/or afraid of change, and/or have no imagination. So what? But any reasonable limit is a long way off. With innovation, physics, wealth, people, the limit for humans is infinite. Ah, and you've changed "money" to "wealth"—good for you, Rygg, good for you. Too bad for them. Who are Ehrlich's disciples? After thinking about this over the weekend, I think there may actually be merit to the idea of differentiating debts. I think the way you separate money-debts from antimoney-debts is for initial debts to be money-based, while sold-debts to be antimoney. In this way, antimoney is treated like an investment or speculation (like packaged debts), so if they prove to be unsound, it fails in isolation. This protects the owners of the money-debt, and keeps their loans secured and defined. Only obvious to the faithful AGWite. Ehrlich's disciples are the followers of modern Luddite Paul Ehrlich and the Club of Rome's "Limits to Growth" model that fails. Why stop at money and anti-money you charlatans? Hijack more of physics for your pseudoscience, like this: imbed money in eleven dimensions and call it Money-theory, and that way the effective low-energy limit of Money-theory becomes an eleven-dimensional field theory with a bosonic sector that includes the metric tensor and a 4-index antisymmetric tensor field strength, and then the entire low-energy theory would have a fermionic field of spin 3/2 which, when couple with the bosonic fields, gives rise to well-known theory of supply and demand. Money theory is a mistake that macroeconomists love to make in order to keep busy. There is no need for new language like anti-money (just as there is no need for an anti-Christ), it is clear without this. When a entrepreneur wants to borrow money and the bank refuses, he/she can still borrow from friends, relatives or even the government without any new money changing hands. The lender simply writes a promise to pay and the entrepreneur uses this document to purchase what he/she needs to start the business. The promissary note so created has a limited life and must be returned to the lender at a specified time. Should it be necessary and the parties willing more credit can be extenede in this way. The claim of a money shortage is not the reason why mosern macroeconomies have been failing. That failure is due to a lack of opportunity in suitable land not being made available. But due to the poor way that macroeconomics is currently being taught there seems to be no distinction made. (continued from last posting) Consequently the money that is thought necessarily invested into both these things, is thought to create the same kind of limitation. This is not so and speculation in land values by withholding useful sites, drives up their access cost. This means that the product costs more and the demand falls. Unemployment follows and poverty is not far behind. Unfortunately the smoke-screen caused by all of this money theoty is raised so as to deliberately hide the truth as explained here. That failure is due to a lack of opportunity in suitable land not being made available. What lack of suitable land?